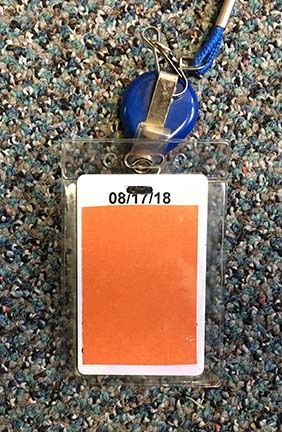 If you work for a government agency or high-tech business that uses a badge ID or CAC (common access card) for admittance to the premises/military base, and/or for building access and computer access, you understand how important it is to remember to take it with you everywhere. 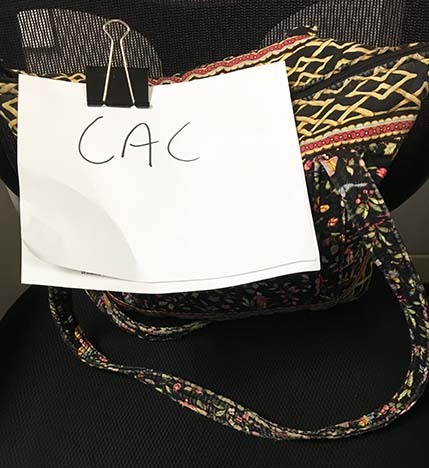 And you need a foolproof way to remember CAC or ID badge. If you forget… there aren’t too many things worse than not being able to enter the property on Monday morning when you’re headed to work! Or being locked out of the room where you working on a big project because you jumped up and ran to the restroom quickly, forgetting your ID. After years of experimentation, I finally came across the winning combination. 1) Cut a piece of bright red or orange paper and put it in the plastic CAC holder underneath the CAC. (I carry a second badge, so it sits on top of that.) That way, when the CAC is missing and you glance down, you immediately see the wrong color (orange — not white) — and a color that signifies emergency, at that — and you know immediately something isn’t right. 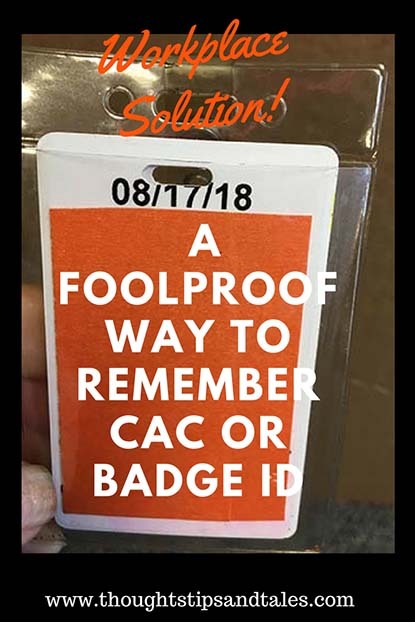 If you’re required to wear and use an ID badge or CAC at work and have an idea that helps you remember it, please share it! This entry was posted in life and tagged badge, badge ID, CAC, common access card, forget CAC, ID, ID badge, work. Bookmark the permalink. I hate when I have to go back home halfway to work because I forgot it! You’re smarter than I am to remember it half way there! blogqueendiane, thank you for this post. Its very inspiring. I’ve experienced that dreaded feeling approaching the parking garage and frantically searching my purse for my entry badge. Thankfully, I’ve not yet forgotten upon leaving home. At work, it stays on me so I’ve never had to go back to my cube for it. In the morning, it’s just become habit – keys, phone, badge. Then when I get in my car I put it in my console so I’m not ripping apart my purse for it with a line of cars behind me! 🙂 You’ve shared some good tips!